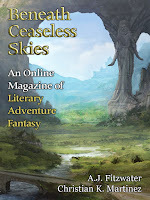 "The Ghostpotion Games," by Christian K. Martinez [bio] (edited by Scott H. Andrews), appeared in Beneath Ceaseless Skies issue 252, published on May 17, 2018. Pro: Erinia gets her wish—over and over again—to compete against Isadore in an exciting challenge, even though it’s a contest neither can ever win. Given the casual cruelty with which they create the game pieces (we hear them screaming), it’s fitting that both of them are stuck in this loop. Finally, the description of the contest itself is quite exciting. Con: The story puts its worst foot first; the description of the creation of the game pieces is long and dull--other than the screaming. The real bad guys here are the nine empresses, and they get off scott-free.